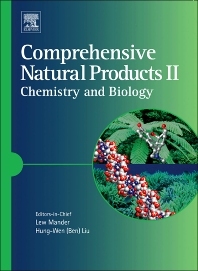 This work presents a definitive interpretation of the current status of and future trends in natural products—a dynamic field at the intersection of chemistry and biology concerned with isolation, identification, structure elucidation, and chemical characteristics of naturally occurring compounds such as pheromones, carbohydrates, nucleic acids, and enzymes. With more than 1,800 color figures, Comprehensive Natural Products II features 100% new material and complements rather than replaces the original work (©1999). Modern Methods for the Investigation of Natural Products – analytical techniques to investigate structures and methods used by natural product scientists. Lew Mander was born in Auckland, New Zealand, where he completed his BSc and MSc (hons.) degrees at the University of Auckland (the latter with R. C. Cambie). After moving to Australia, he obtained his PhD in 1964 for his research on the structures of the Galbulimima alkaloids at the University of Sydney under the supervision of C. W. Shoppee, E. Ritchie, and W. C. Taylor. After 2 years of postdoctoral studies with R. E. Ireland, initially at the University of Michigan and then at the California Institute of Technology, he returned to Australia as a lecturer in organic chemistry at the University of Adelaide. He moved to the Australian National University in 1975 as a senior fellow in the Research School of Chemistry where he was subsequently appointed Professor in 1980, serving two periods as Dean (1981–85; 1992–95) and recently made emeritus. He was a Nuffield Fellow at Cambridge University in 1972 with A. R. Battersby, and a Fulbright Senior Scholar at the California Institute of Technology in 1977 and at Harvard University in 1986 (with D. A. Evans on both occasions), an Eminent Scientist of RIKEN, Saitama, Japan (1995–96), and a Distinguished Alumnus Professor, University of Auckland (1992). Also, he has been a visiting professor at the universities of Sydney, Cambridge, Alberta, Colorado, and Canterbury (New Zealand). He is a Fellow of the Australian Academy of Science and The Royal Society (London). His research interests are concerned with the development of methods and strategies for the assembly and manipulation of complex natural products with a special interest in the role of gibberellins in plant growth and development. Hun-wen (Ben) Liu was born in Taiwan and graduated with a BS degree in chemistry from Tunghai University (Taichung) in 1974. After 2 years of military service, he began his graduate study at Columbia University where he carried out research under Professor Koji Nakanishi. His work on the additivity relation in exciton-split circular dichroism curves and its application in structural studies of oligosaccharides earned him a PhD in 1981. He then joined Professor Christopher Walsh’s group at MIT as a postdoctoral fellow and became involved in the field of mechanistic enzymology. In 1984, he became an assistant professor in the Department of Chemistry at the University of Minnesota. He was promoted through the ranks to be the Distinguished McKnight University Professor in 1999. In 2000, he moved to the University of Texas at Austin, where he now holds the George H. Hitchings Regents Chair in Drug Design and is Professor of Medicinal Chemistry, Chemistry, and Biochemistry. His research lies at the crossroads of biological and organic chemistry, with particular emphasis on enzyme reaction mechanisms, natural product biosynthesis, protein function regulation, enzyme inhibitor design and synthesis, and metabolic pathway engineering. His multifaceted approach in studying various bioorganic problems has been recognized by several awards, including the National Institutes of Health Research Career Development Award (1990), the National Institute of General Medical Sciences MERIT Award (1999), the American Chemical Society Carbohydrate Chemistry Division Horace S. Isbell Award (1993), the American Chemical Society Organic Chemistry Division Nakanishi Prize (2007), and the American Chemical Society Biological Chemistry Division Repligen Award in Chemistry of Biological Processes (2008). He is an elected fellow of the American Association for the Advancement of Science (2005), the American Academy of Microbiology (2006), and the Academia Sinica (2008). He is an active member of a number of professional societies, and serves on many advisory boards, review panels, and editorial boards. Writing in the preface, renowned natural products chemist Koji Nakanishi praises “Lew Mander and Hung-Wen (Ben) Liu for having assembled an extraordinary team of editors for the nine volumes, who in turn have brought together top natural products scientists to review the respective topics…CONAP II should not be regarded merely as a reference source. Instead, one can take it from the bookshelf, flip through the pages, and go through some sections for one’s entertainment and knowledge enhancement. "This work is essential for libraries at institutions where natural product research is seriously pursued or contemplated."